Now that Edition III of the book is done, there is finally some time for some old-fashioned ArchiMate fun. So, as a variation on the theme “what is wrong with this picture“, I would like to invite you to a quiz (of which I plan to offer more questions in the future). I will ask a simple question: given a situation, how do you model this in ArchiMate 3? You can send answers to me (see below) and I’ll add these to the article. I might hand out prizes (free licenses for the book) if answers are particularly good, funny, or inventive. A company has two applications: TradingApplication and ReportingApplication. During the day, each trade is entered into TradingApplication. Trades have a cycle and are only definitive if the whole cycle is complete (e.g. payment received, goods sent). At the end of the working day, the TradingApplication sends the complete details of all trades to ReportingApplication that needs these trade details to be able to create important reports for the management. For this ReportingApplication offers a RESTful API (Application Service / Application Interface) that is used by TradingApplication. Model the application-relation (no infra, no business) between TradingApplication and ReportingApplication in as many different ways as you can. 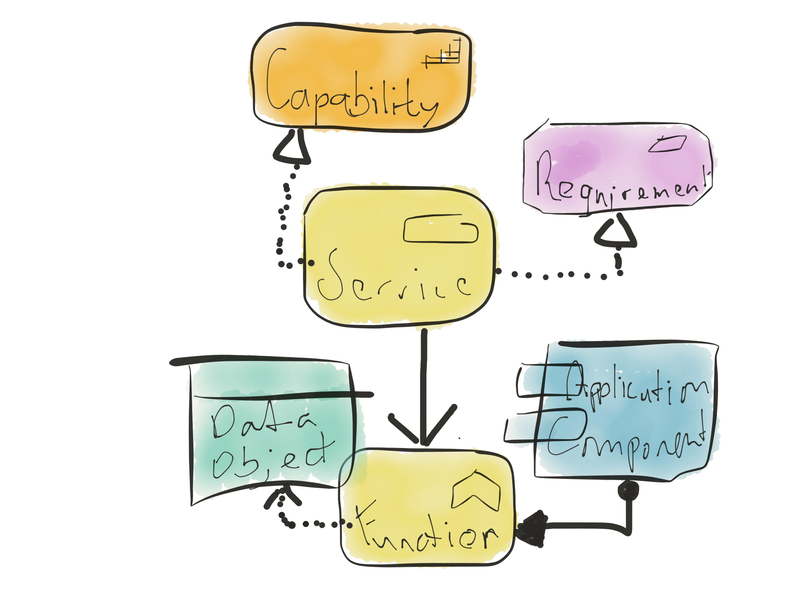 Note, you can choose to either use behavioural (Application Function/Process & Service) or active structural (Application Component & Interface), I am not looking for all the different combinations of active & behaviour you can make there. Trivial variations (that can be derived) do not count as separate solutions. The easiest is to just use Application behaviour and Data Object. Answers are to be sent to info@masteringarchimate.com. Images need to be in vector PDF form with a single PDF file for each diagram (if more than one) and the images must be the size of the diagram (no A4 PDF with some small diagram in the upper-left corner, I cannot put these on this page). If you are new to ArchiMate and trying this is part of your learning curve, go to the book’s home page and at least download the Free Syntax Excerpt of Mastering ArchiMate Edition III.